NETWORK UPDATE: There were no changes from this morning’s numbers in today’s final ratings. As is usual for Mondays, cable bragging rights belonged to USA and VH1. The former’s WWE was at 1.46-1.32 over its 3 hours, 0.07 below last week’s low end. 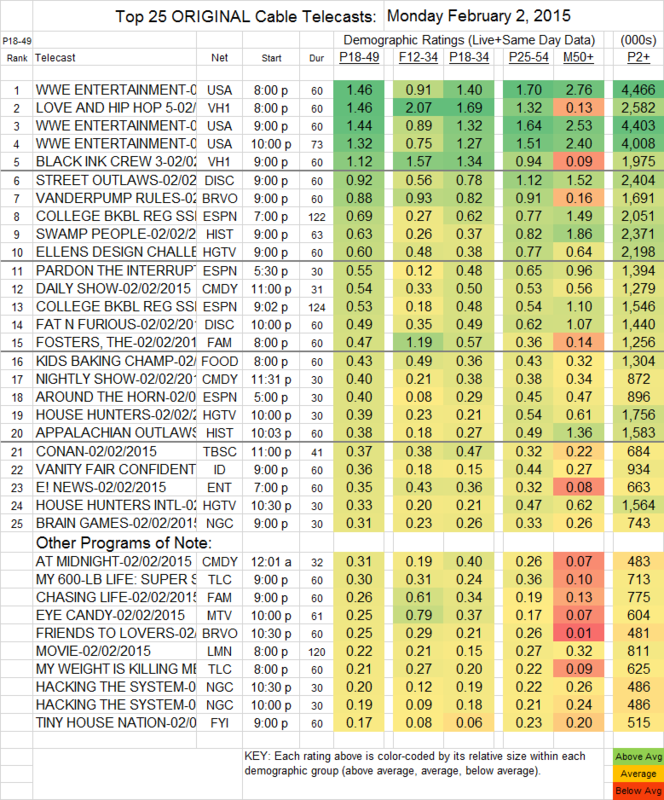 On VH!, LOVE & HIP HOP tied WWE at 1.46 (down 0.06 from last week), with BLACK INK CREW at a steady 1.12. Discovery’s STREET OUTLAWS dropped 0.12 to 0.92, with FAT N FURIOUS down 0.05 to 0.49. VANDERPUMP RULES (Bravo) rose 0.06 to 0.88, while FRIENDS TO LOVERS was steady, if low, up a tick to 0.25. History’s SWAMP PEOPLE was at 0.63, and APPALACHIAN OUTLAWS at 0.38. On ABCFamily, THE FOSTERS shed 0.02 to 0.47 and CHASING LIFE lost 0.03 to 0.26. MTV’s EYE CANDY gained 0.06 to 0.25, which it desperately needed (and which may still not be enough to survive). At the start of its 3rd week, THE NIGHTLY SHOW (0.40) continued to hold its DAILY SHOW lead-in (0.54) quite well.